Although Shaista Lodhi Has Started Wearing Hijab, People Are Noticing Something 'Wrong' In Her Picture! 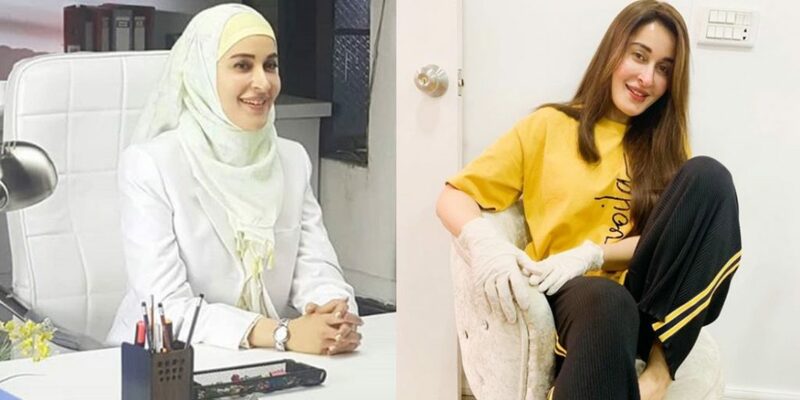 Although Shaista Lodhi Has Started Wearing Hijab, People Are Noticing Something ‘Wrong’ In Her Picture! Shaista Lodhi has always been in the puddle of controversies. She almost got banned from doing her shows, when she hosted a show where she invited Veena Malik and mocked a wedding. After that, she was banned by PEMRA! Also, she was all over the headlines when she got married for the second time, and people had all sort of question about her first marriage. She said that during my show when I advised women over their marital matters, people commented that how can a woman who herself couldn’t save her marriage is advising others. She’s now happily married and content with her current marriage! But over her Instagram people are admiring her for the new look! The hijab is really looking good on her! She’s carrying it quite well. She’s now started wearing hijab, maybe because she’s recently returned from Umrah with her husband! She carries anything quite good! Be it eastern or western! No? But in her recent photo, people are noticing something very odd! Something you wouldn’t even think of… We bet!! No, it was not about her hijab, nor was it about her dress or facial features but her slippers. LOL! Yesss. People are noticing her different slippers! The color of each slipper of hers is different. Look closely! She’s setting up trends bruhh! People are curious to know where did she buy it from. Bilkul jee… Ab yeh hai fashion! LOL! Shaista Lodhi, previously known as Shaista Wahidi, then revealed in an interview how and why she married her now husband and the reason she left her first husband. She ended a 13-year-old relationship from which she had 3 kids, and she also mentioned how she did not regret putting an end to that marriage. She got divorced long before she remarried, she shared that it was quite difficult to get the divorce from her ex-husband and that the decision was entirely hers. Shaista said that when a relationship loses its essence, it becomes a mere burden over your shoulders.